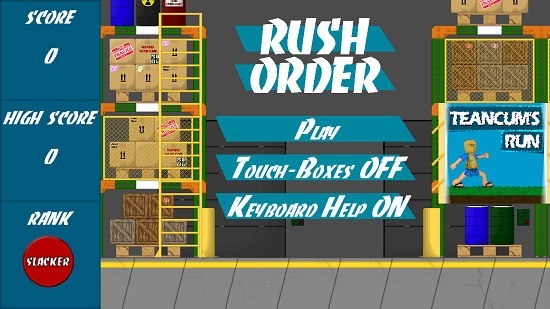 Rush Order is a free game app for Windows 8 devices in which you have to stack up the packages as fast as you can. Your company has to ship these boxes and a friend of yours will throw the boxes from the top, your job being to make sure that you bounce the boxes on your holster plate in a way that the boxes fall into the shipping container. If the boxes which your friend is throwing from the top fall on the ground, it’s game over. 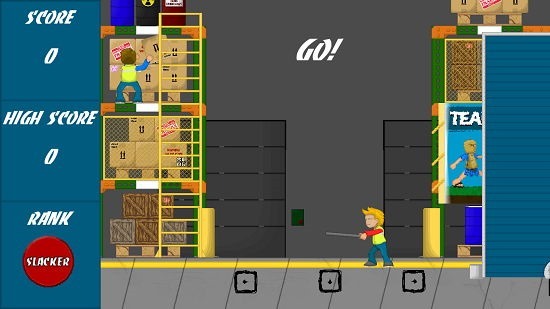 The game works on simple keyboard controls where you can control the main character who has to catch the boxes via the arrow keys (left and right). Make sure to align the holster plate of your character with the falling boxes. The below interface will be seen when you run the app. Simply click on the Play button to start the game. Once pressed, you will be taken to the gameplay screen which looks like the below screenshot. You can see the friend at the top right from where he will throw the boxes. You have to bounce these boxes on your holster plate by aligning yourself directly underneath the falling boxes and bounce the package boxes inside the shipping container right behind you. You can see one of the boxes being bounced in the screenshot below. The character can be moved around with the left and right arrow keys. You can keep a track of your score at the left side of the screen. At the end of a level when a box falls on the ground, it’s game over and you’ll be shown your score in the following format. This winds up the main features of Rush Order for Windows 8 and 8.1 devices. Rush Order makes for a great way to while away your time on your Windows 8 or 8.1 device. You can grab the game for free from the Windows App Store by heading over to the link below.